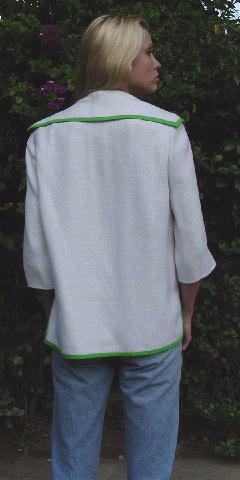 This vintage '60s jacket has 3/4 length sleeves, a big collar, and long lapels. It's a Navajo white with a deep yellow green trim. 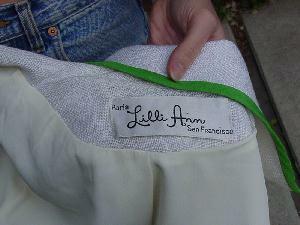 It has faux pocket flaps and a nice cream color lining. The side seams have 6 1/4" slits. There is some age discoloration at the back neckline. We're not sure of the fabric content, but it's a soft weave.